Decided to re-prepared this as the second attempt and adhere as closed to the Hainanese tradition as possible. 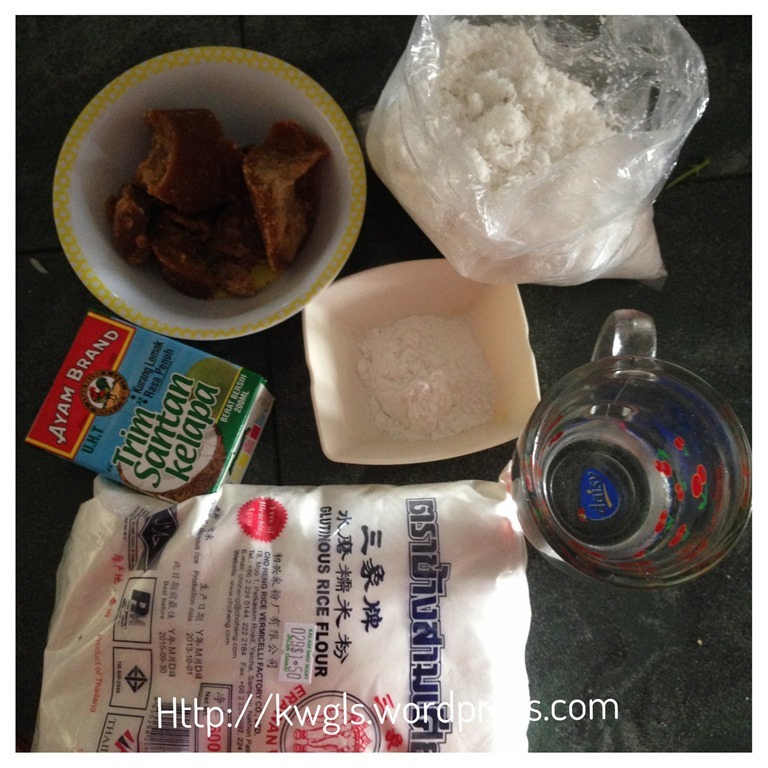 Slightly changes in the recipe to enhance the texture of the dough and incorporate a new picture of wrapping as required by Hainanese traditions. 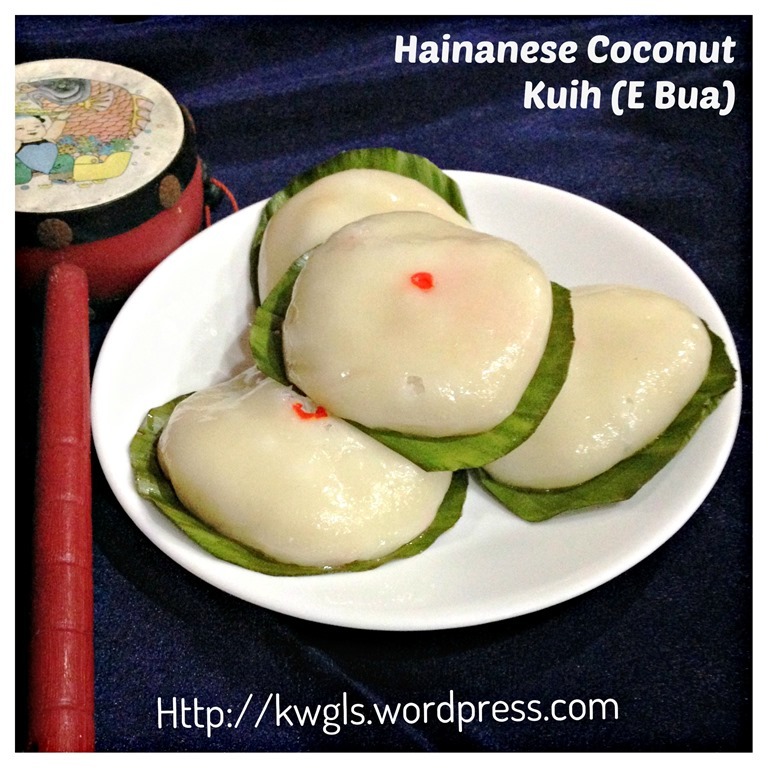 First, I have to qualify that I am not a Hainanese descendant and I have never tasted the authentic E Bua (in Hainanese) or Yi Ba (薏粑 in Chinese) or just Hainanese Glutinous Rice Coconut Cake. However, in my home town, Kuching or in Singapore hawker centre, I am very familiar with another common variants of this cake. 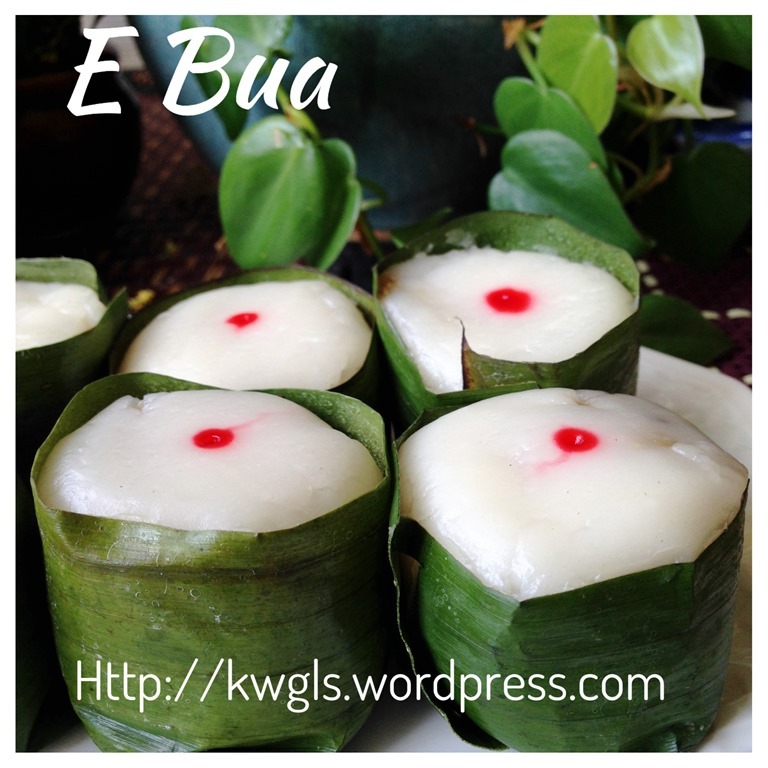 Authentic E-Bua should have banana leaves wrapped along the side of the cakes and the fillings were dark coloured shredded coconut, simmer with coconut sugar and have grounded peanut, sesame seeds and pounded ginger added to it. Whereas the common hawker version is just placing the cake in a piece of banana leaves without wrapping the sides, and most of the time, the filling is just sweeten white coloured shredded coconut. Some stalls may use coconut sugar too. This is the recipe for the simpler hawker version. 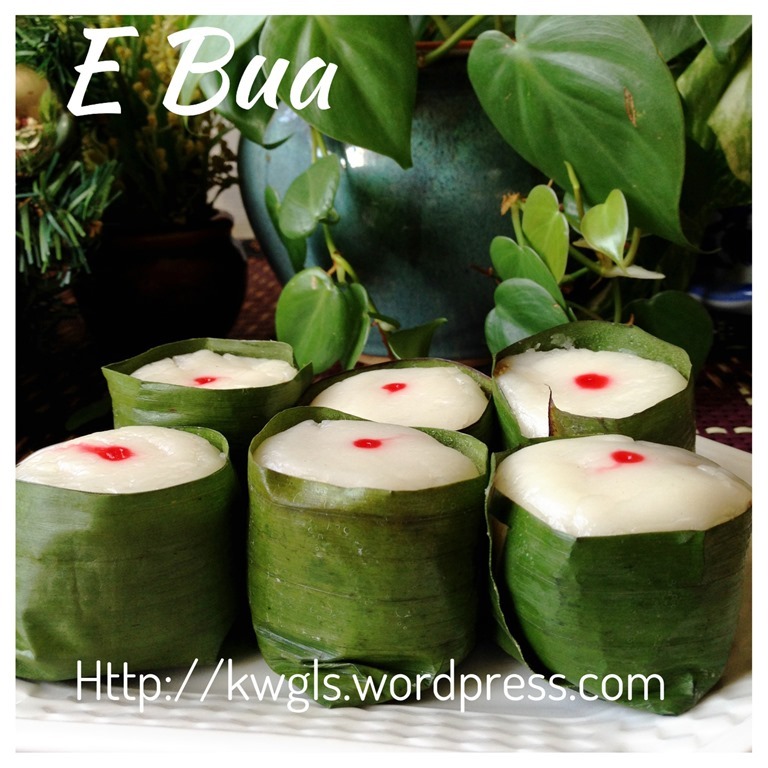 However, I have also listed out all the other ingredients that is required for an authentic E-Bua. Depending on the purpose of your preparation, for normal home consumption, I would think that the hawker version is adequate whereas for big festivals, you may want to consider the authentic version. 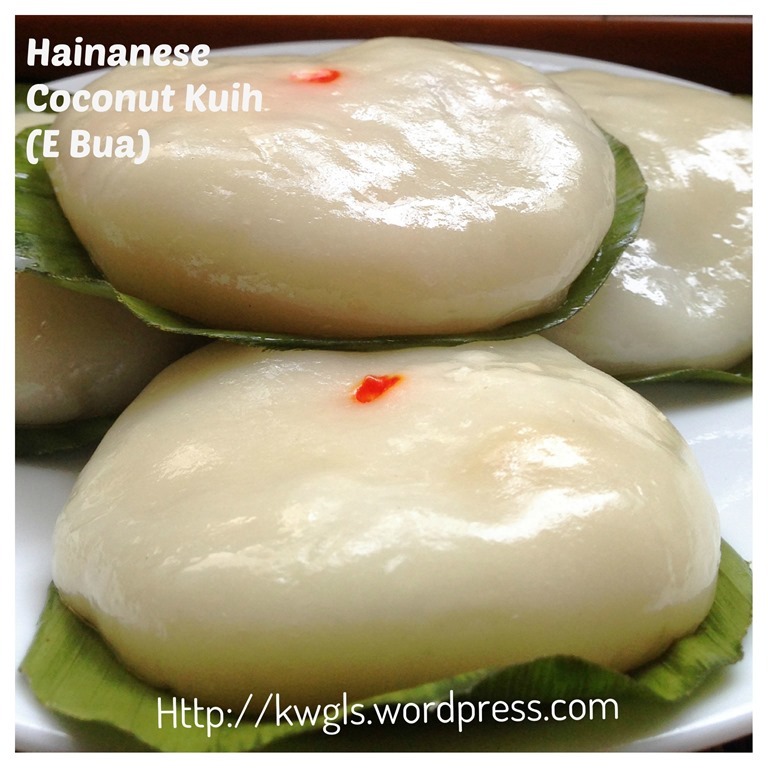 Hainanese prepared the authentic version for big occasions such as marriage ceremony, baby showers and etc.. Experts looking at my cake will know that my cakes were over steamed. Yes, I have over steamed for additional 5 minutes. Instead of the 10 minutes, I have forgot to look at my watch and steamed for 15 minutes instead. 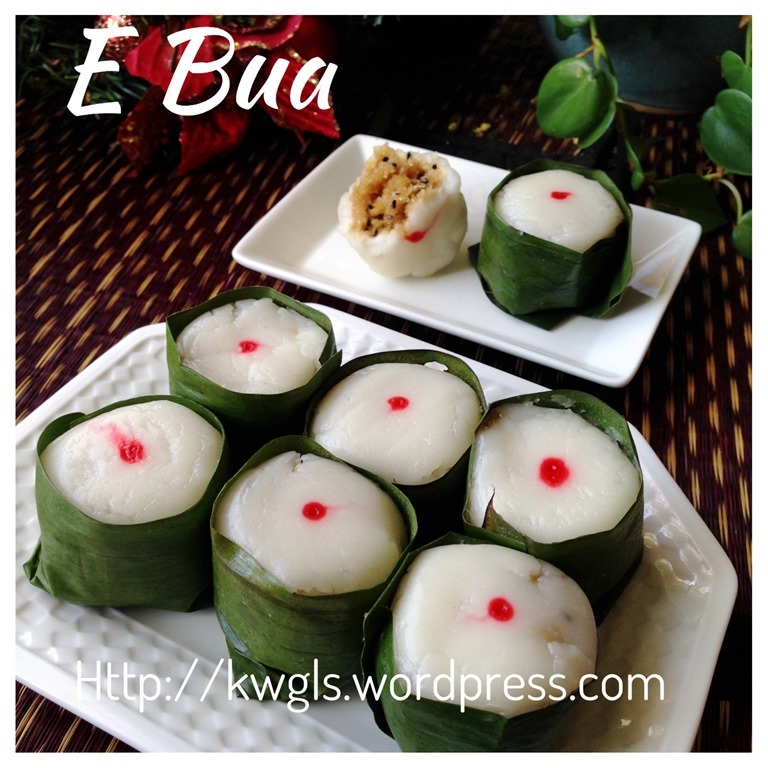 The effect is the E-Bua skins were not smooth and the shape is not round. So, readers have to remember the steaming time is very important and any over steaming will ruined your day’s effort. I have decided to issue the report because after I posted in Facebook Group, quite a number of members are interested in preparing this cake. Many told me that they missed the cake and wanted me to share the recipe. 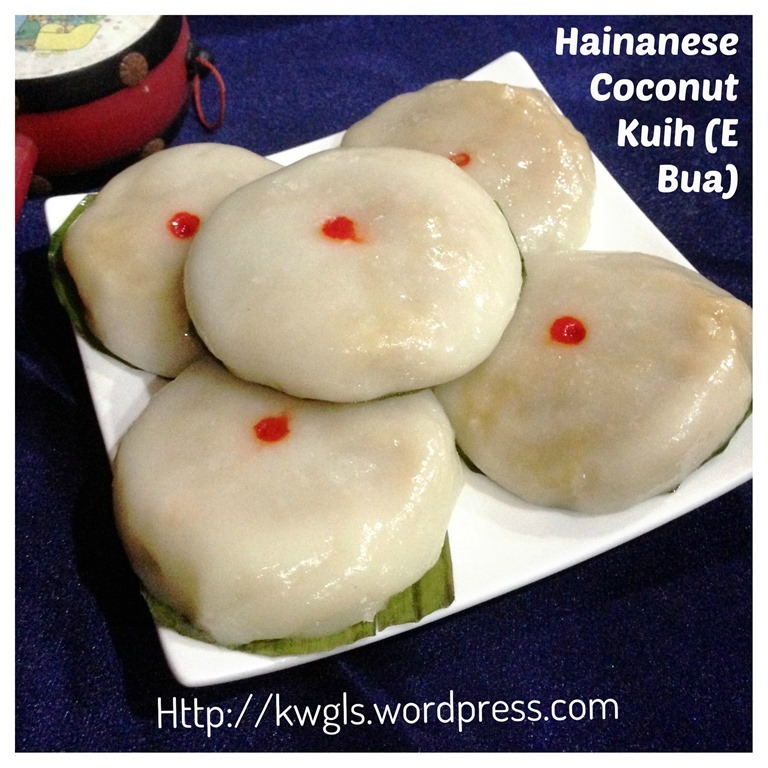 I have taken the recipe from YUMMY HAINANESE COCONUT KUEH. 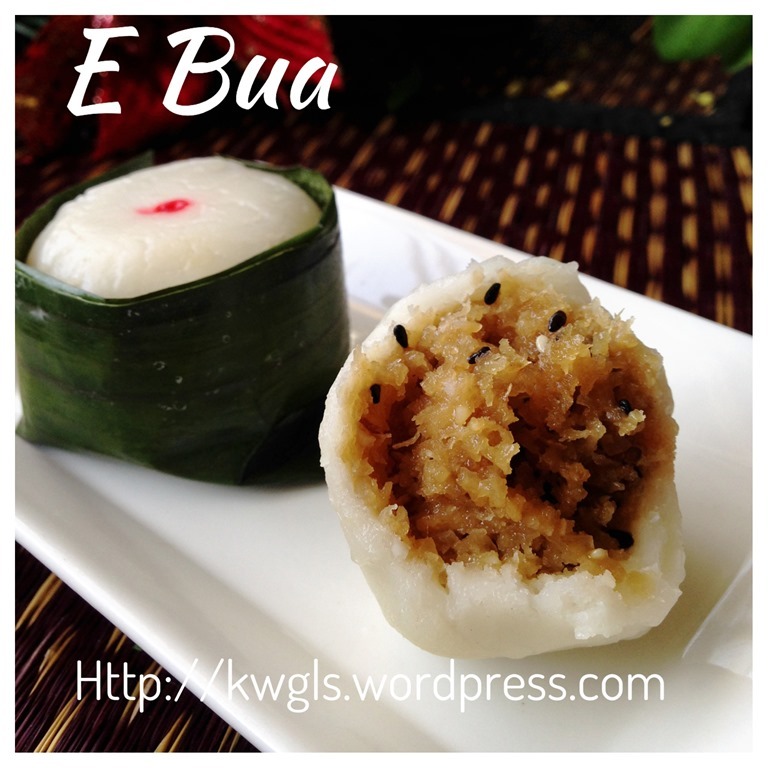 In this post, you can see the pictures of the authentic version of E-Bua and its fillings. A few tablespoons of cooking oil for glazing after steaming. Note that the colour of your filling will very much depends on the type of sugar used. Not all grades of coconut sugar are dark enough. In China, coconut sugar is not used and substitute with brown or dark coloured black sugar. In a big mixing bowl, put the salt, sugar and glutinous rice flour. Add in the warm to hot water and use the spoon to stir until it form some sticky dough. Add in the coconut milk. Use hand to knead until it form a pliable dough. The dough should be smooth. 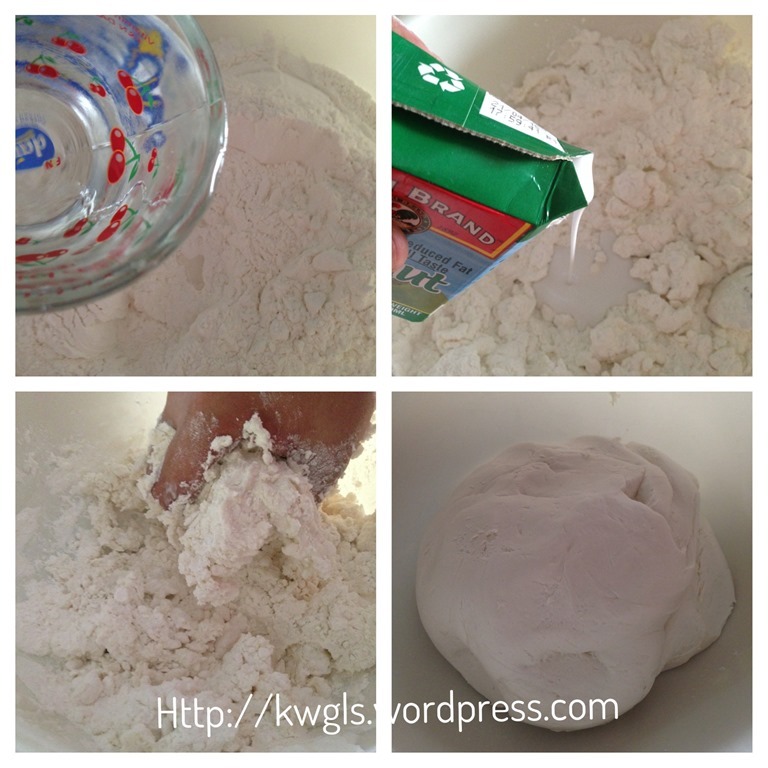 Add water tablespoons by tablespoons if you find that the dough is too dry. Cover with clingy wrap or wet towel and rest for 20-30 minutes. If you want, you can divide the dough into about 30 – 40 grams each depending on how thin the dough you can manage it. Pound the ginger in the pastel and mortal. 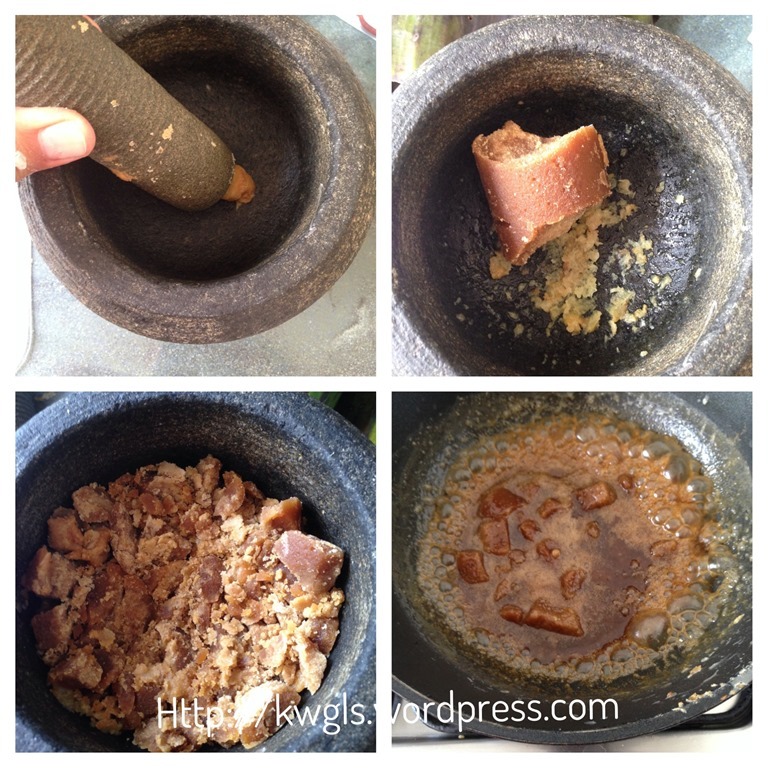 Put the coconut sugar or gula melaka. Pound in until small pieces. This process is just to expedite the melting process in the next step. You can use knife to chop if you do not have the pastel and mortal. In a pan under medium heat, add water, gula melaka, pounded ginger and pandan leaves bundle (I did not add in this illustration). Let it boil until all the sugar are melted. Add in the grated coconut and stir until well mixed. Add in the plain flour to thicken the grated coconut. Once well mix, dish up and let it cool before shaping into individual balls of about 30-40 grams. Note that my ratio of dough to filling ratio is 1:1, meaning if dough is 30 grams, filling is also 30 grams. However, feel free to adjust the ratio to the ratio that you are comfortable with. Take a dough ball, slightly flatten it, put a filling ball on the centre. Seal the edges. Shape it again in a round shape. Put on top of a piece of banana leaves. Flattened it slightly. 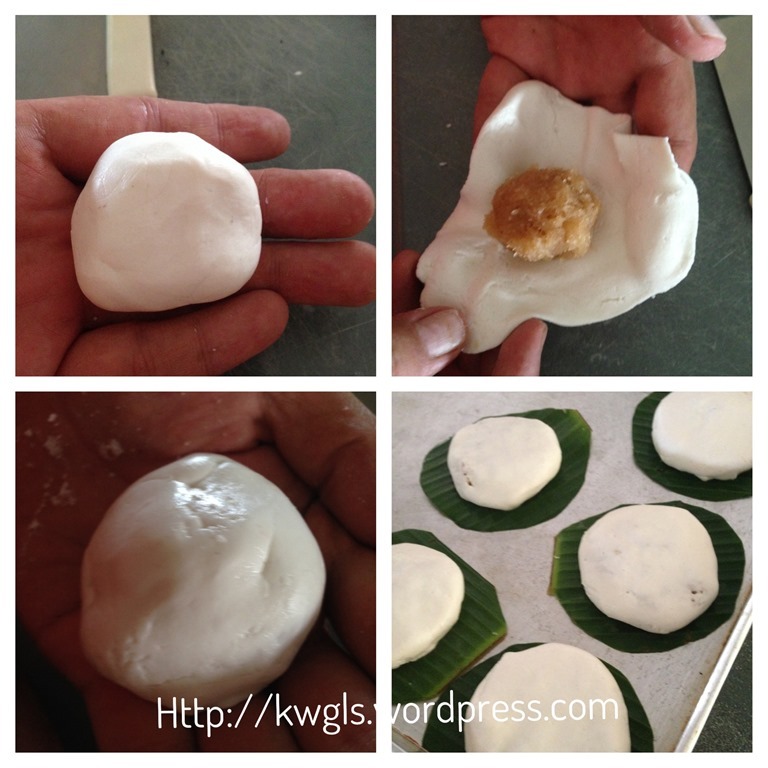 Put some glutinous rice flour on your hand if you find it too sticky. 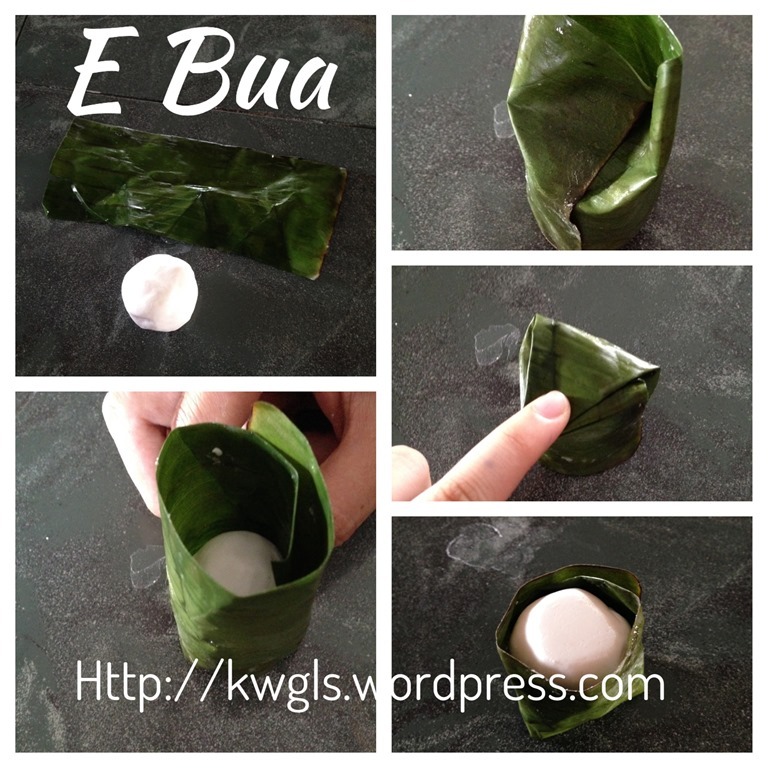 After wrapping the filling, have a piece of banana leaves of 5cm x 12 cm. Wrap the banana leaves surrounded the ball. Tuck in the bottom and reverse back and the wrapping is done. If the leaves are too hard, you can cut some vertical lines on the part to be tucked in and pressed down to facilitate the tucking. Dip a tooth pick in some permitted red colouring and place a small dot on top of the dough. Heat up a steamer with water adequate of steaming for the cake for about 10-15 minutes. Bring to boil and steam the cake under medium heat for 10 minutes. Brush some cooking oil on top of the cake while the cake is warm. Let it cooled completely (about 2-3 hours) before enjoying yourself. 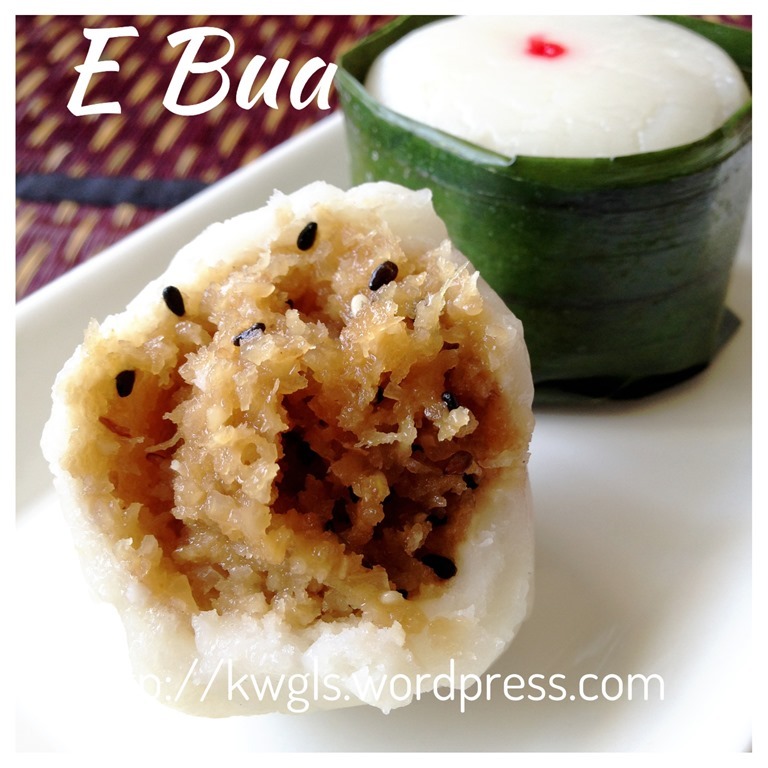 This glutinous rice cake is rather common during my childhood day. 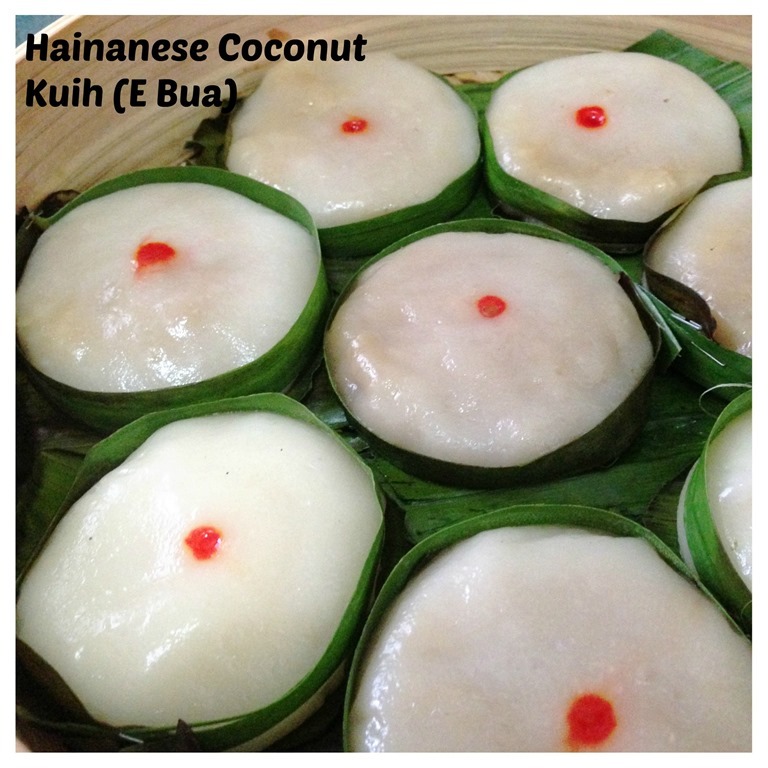 I love the cake very much because of its sweet coconut fillings. 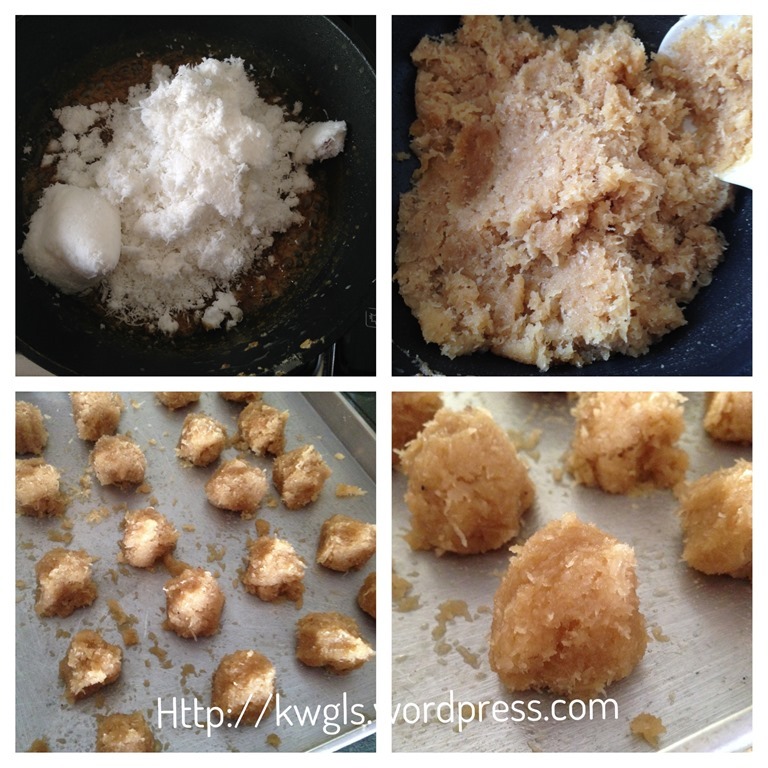 You can use white sugar if you do not have coconut sugar. 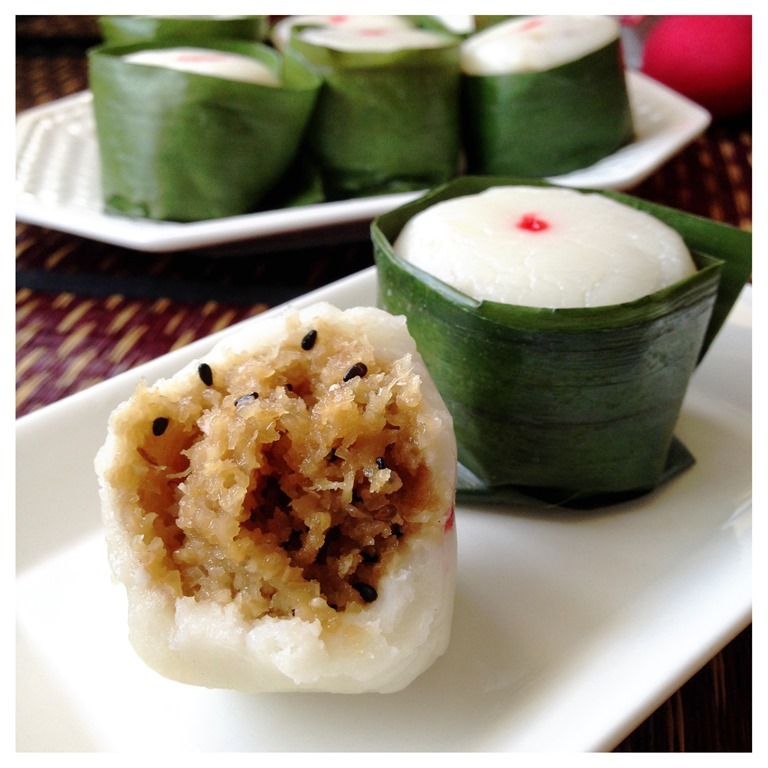 You can also go until the extend of wrapping the sides of the cakes with banana leaves and putting grounded peanuts and sesame seeds to make it more authentic. Pardon me for the images of over steaming E-Bua. 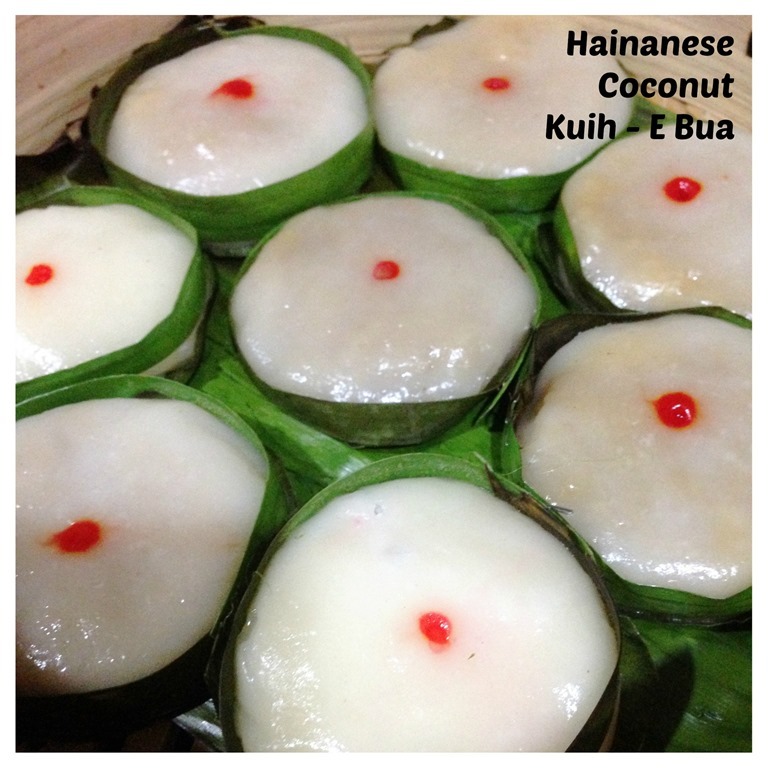 This entry was posted in Chinese and Asian Cakes and Snacks, Food Preparation Series and tagged 8, E bua, 薏粑, GUAI SHU SHU, Guaishushu, hainanese coconut kuih, hainanese kueh, hainanese kuih, kenneth goh, kuih koci, postaday, Yi ba, 海南薏粑粿. Bookmark the permalink. You are missing peanuts yo. I did say that in the blog that peanut and ginger can be added.. 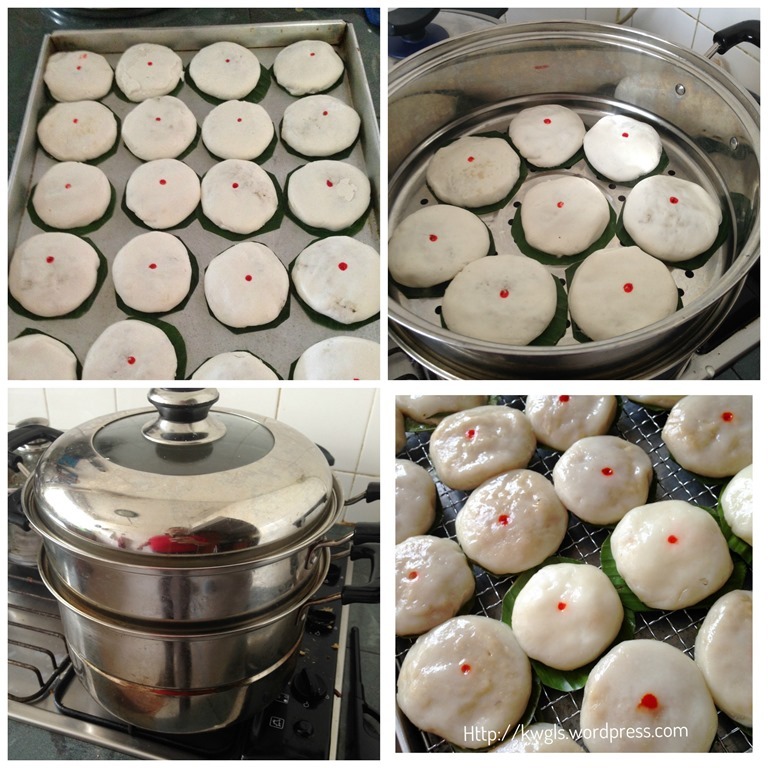 Thanks for sharing, Kenneth, try to reduce the heat when steaming the kuih, may be too high heat, your kuih rised up too much then fell down again, so the “skin” is uneven. 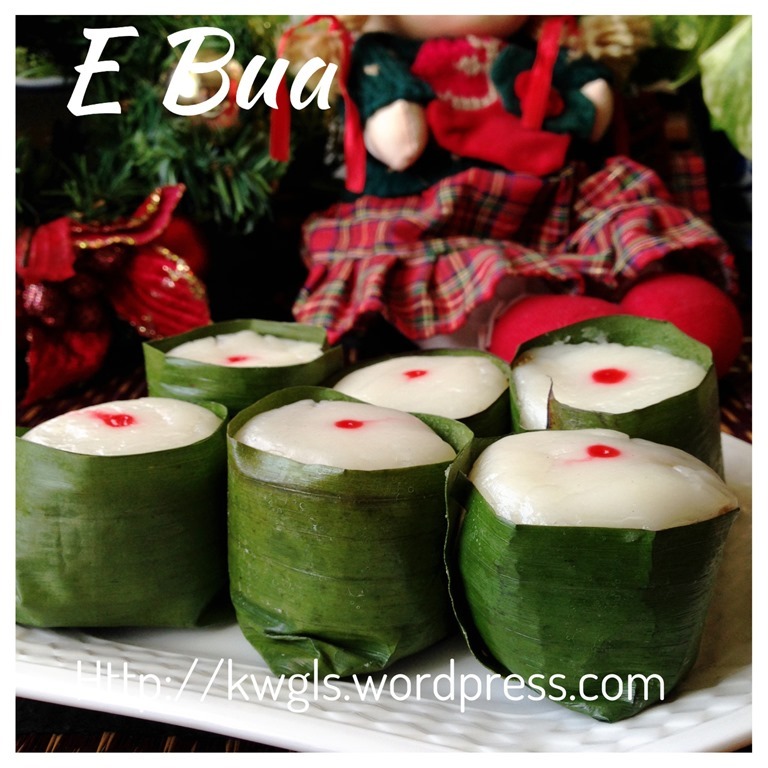 I had the same experance when I made other kuih.